Strength Isn’t Something You Have. It’s Something You Find. For the past several years, The U.S. Citizenship and Immigration Services’ Washington field office has held a Children’s Citizenship Ceremony at Sully Historic Site. This year, on May 9, 2017, 17 children of ages five to 13 from 12 countries took an Oath of Allegiance and received certificates of citizenship. I would like to thank the Sully staff for inviting me to speak here today and share with you a little bit of my story, and I would like you to know that I am really honored to share this day with all of you. When I was 17 years old, many years ago now, I took part in a citizenship ceremony like you are today. Unfortunately, my ceremony did not take place at a beautiful historical site on a beautiful sunny day. Mine took place in a gloomy, mostly gray courtroom in Buffalo, New York, and if you have ever been to Buffalo you know it can be a gloomy place. But somehow that didn’t take away from the day. I still remember how excited I was to become an American citizen, and I remember thinking, as I sat there holding my little American flag, now no one can tell me I don’t belong. My journey to becoming an American citizen began in 1975 when my Mom and I arrived on a cold winter’s day at New York’s Kennedy airport. My Dad, who I had not seen since I was one, was there waiting for us. He’d left Cuba on my first birthday and, after crossing no-man’s-land, was granted political asylum at the American Naval Base in Guantanamo. As a result of his defection, my mother and I were not allowed to leave Cuba for six years. But that day in New York, I just remember meeting my Dad for the first time and how cold it was. And then we went to Rochester, which was even colder. I was happy at first, in spite of the cold. I had a room of my own, a beautiful canopy bed – and waffles! Life couldn’t get better for an eight-year-old. Sure, I couldn’t understand what the cartoons were saying, but hey, at least there were cartoons. But then I had to go to school. You see, in 1975, at Neil Armstrong Elementary School in Rochester, there was no ESl program, nor translators, nor teachers who could speak Spanish. It was very difficult. I went from having lots of friends to not having a single friend. I went from doing well in school to not knowing how to do well in school. Thank goodness for math – the only time in my life I loved math. I’m more of a history person. But that first year, I cried myself to sleep most nights and begged my mother not to send me back. And I’ll be honest, there were times I didn’t think I could do it. But you know, strength isn’t something you have. It’s something you find. And it was in the sadness and in the struggle that I found the strength to rely on myself, the strength to keep working hard to understand and be understood, and the strength to not give up. That’s what I did. I trusted in myself when others doubted me, I realized that things wouldn’t change overnight, so I waited. And I chose not to hate, even when people were unkind, even cruel. And you know what? A year later I was able to function, and a year after that I was just another kid in the classroom, which is really important when you are in 4th grade. As a young person, and now as a mother of three wonderful young people, one of the things I’ve loved most about this country is our right to dream about what we want to be and our right to work to make that dream a reality. I graduated from college in 1990 with a major in International Studies and Anthropology in spite of my parents suggesting that I study something more practical. In 1993, I received a master’s in education, and I went on to teach early American history in Arlington County for the next eight years. And in teaching, I learned. I learned who we were, who we are, and who we hope to be. I learned that this is a land of immigrants. Everyone is either an immigrant or a descendent of immigrants. I learned that this country and its citizen-based government was created in committee through debate and compromise. I learned that our ideals of life, liberty, and pursuit of happiness for all people are a work in progress. And yes, we have stumbled, even fallen at times, and certainly have at times taken one step forward and two steps back. But history is a great teacher, and I also learned that we are strong not in spite of our mistakes, but because of them. I learned that we are at our best when we work together to correct injustice and to make the American ideal of equality accessible to all people. I learned that it is a noble thing and a great American tradition to stand up for the rights of others. One day you will inherit this country, as thousands of immigrants have done before you, and I hope you will think about how you will make this country a good place for all of us to live. This entry was posted in Uncategorized on June 30, 2017 by Fairfax County Park Authority. June 19-June 25, 2017, is National Pollinator Week — a chance to learn about the importance of pollinators. The Park Authority’s work with and for pollinators includes the preservation, management and restoration of natural habitat as well as the monitoring of wildlife that use the habitat. We’ve established demonstration sites and waystations that support pollinators, and we provide interpretation, education and outreach activities through our nature centers and parks. One example of that outreach is this blog. Parks have diverse habitats that benefit pollinators, including about 18,000 acres of forest habitat. Those forests are in various stages of growth, which means they host varied groups of wildlife that depend on these changing, growing woods. Parks also have approximately 1,572 acres of non-forested, undeveloped habitats that include meadows and shrub land. That’s more variety for more species that rely on those types of habitats. Parks that include areas with actively managed habitats include Huntley Meadows, Ellanor C. Lawrence, Riverbend, Poplar Ford, and Laurel Hill along with Elklick Natural Area Preserve and Marie Butler Levin Preserve. There are also dozens of sites that fall under the watchful eye of our Invasive Management Area program. Habitat restoration projects have taken place recently at Ellanor C. Lawrence Park (ECLP), Old Colchester Park and Preserve, Huntley Meadows, Great Falls Nike Park, Kings Park West, Wakefield Run Stream Valley, Flatlick, Schneider Branch and Laurel Hill. Most notable among that list is the massive wetlands restoration at Huntley Meadows. Pollinator demonstration sites have been established at Ellanor C. Lawrence Park, Hidden Oaks Nature Center, Hidden Pond Nature Center, Huntley Meadows Park, Riverbend Park, Green Spring Gardens, and at the John C. and Margaret K. White Horticultural Park. Many sites host waystations, including Hidden Oaks Nature Center, the Packard Center, Mason District Park and ECLP. Hidden Oaks Nature Center has led the way in a monarch butterfly tagging and population monitoring program. Monarch populations have been declining because of a loss of habitat, and these efforts will help Fairfax County do its part in reversing that loss. Tagging has been taking place since 1996, and three to nine tagging sessions are held annually. Public involvement in those is welcome. Green Spring Gardens and some libraries and schools have joined that effort. We’ve been raising and releasing monarchs since 2005 in partnership with Monarch Watch and volunteers. Parks also have helped Fairfax County Public Schools develop a curriculum for raising monarch butterflies. Dozens of pollinator interpretation classes are hosted by Park Authority parks for people from preschool to adult. Your local nature center will have information about them. Other education efforts revolve around school field trips. Pollination and pollinators are part of the Virginia standards of learning for second through fourth grades, and those units are presented at nature centers. Among the topics covered are insects, ecosystems, and plants. Dozens of stewardship brochures that help county residents understand aspects of nature are available at parks and other county offices. They’re also online. Brochures specific to pollination include those titled Pollen, Native Backyard Plants, and Bees. If you want more information about Park Authority efforts to protect pollinators and all they do for us, you’ll find it on our natural resources web pages. This entry was posted in Uncategorized on June 21, 2017 by Fairfax County Park Authority. A place of calm and respite from noise and concrete. Sanctuary for people and wildlife. This is what Huntley Meadows Park represents to visitors, both human and animal. This is what many of the artists who visit Huntley try to capture in the works that are featured in the park’s Norma Hoffman Visitor Center. Tisara is well known to Alexandrians as a photographer for her portrayals of the area’s residents and historic places. She staged an art show, her first at the park, at Huntley Meadows in 2003. “Sanctuary is the name I called my photographic exhibition because Huntley Meadows was, and is, a personal sanctuary for me,” she said. The exhibit featured black and white photos of vine-covered trees at the park. Shortly after that first show at Huntley Meadows, Tisara took her first class in mosaics. At that time, in the early 2000s, photography was becoming increasingly digital, and Tisara no longer kept a darkroom in her home. Photography lost a little of its magic for her, and mosaics captured her interest. She returns to Huntley Meadows Park this summer with a new show titled “Inspired by Nature” that is built around mosaics tied to feelings sparked by the park. Some of her mosaics initially were inspired by photographs taken at Huntley Meadows. December 4, 2001: I am grateful for this sunny morning. I am looking forward to trying to capture the vines “dancing” at Huntley Meadows Park. They seem to me like dancers. December 9, 2001: I went to church in the morning. Then I re-shot the trees and vines at Huntley Meadows. I’m happy to have the chance to shoot the same scene again and again to adjust the exposure and I’d like to try it at different times of day and in different kinds of light. Fog would be nice. The fog shots turned out harder than I thought. I drove to the park one foggy morning but by the time I got there, there was no fog in the park. I went again with better luck. Back she is, with the first mosaic show to be featured in the Norma Hoffman Visitor Center. Quarterly art shows at Huntley Meadows Park are expressions of inspiration that foster connections with nature. The Norma Hoffman Visitor Center has hosted photographers, potters, painters, and other creative talents. Nina Tisara’s “Inspired by Nature,” the park’s first mosaic exhibit, will be at the center until August 31, 2017. Author Halley Johnson is the Volunteer and Outreach Coordinator at Huntley Meadows Park. This entry was posted in Uncategorized on June 16, 2017 by Fairfax County Park Authority. 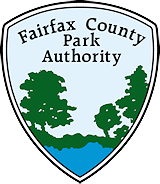 Fairfax County Park Authority volunteer Norma Hoffman passed away Sunday morning, June 11, 2017, after a long illness. She was one of the most extraordinary volunteers in the agency’s history. Hoffman’s impact began in 1978, when a planned four-lane road would have cut through Huntley Meadows Park. Ms. Hoffman had the foresight to understand the damage the road would cause, and so she established the Citizen’s Alliance to Save Huntley and enlisted scientific and legal help. Thirty-nine years later there is no road. The Alliance eventually grew to 600 members and succeeded in having the road plan removed from the Fairfax County Comprehensive Plan. Ms. Hoffman then co-founded the Friends of Huntley Meadows Park in 1985, instituting a model that has been used by subsequent Friends groups at other county parks. Ms. Hoffman served as the Friends president, and in that role used wetland protection laws to prevent any further potential degradation to the park. The two groups worked collaboratively to secure state grants for the stabilization of 1,000 feet of severely eroded stream banks above the park using bioengineering techniques. Her efforts eventually added more than 100 acres of wetlands to Huntley Meadows Park, repaired several failing stormwater ponds on an adjacent golf course, and established a continuous pollution monitoring system, thus protecting a vital water passageway to the Potomac River and the Chesapeake Bay. She also maintained an unrelenting pursuit on behalf of the acquisition of the mansion at Historic Huntley, which is now park property. Ms. Hoffman continued as a volunteer at Huntley Meadows Park for nearly four decades. She was honored with the Park Authority’s highest volunteer service award, received the annual Distinguished Volunteer Service Award from the Virginia Recreation and Park Society, and in the week prior to her passing was named a national Outstanding Volunteer by the National Association of County Park and Recreation Officials. In 1992, the Sierra Club named her one of its 100 Environmental Heroes. Ms. Hoffman taught thousands of children about nature and our responsibility to be environmental stewards. A Park Authority Board resolution noted that she tirelessly served community children in a 30-year crusade to imprint an appreciation for the environment through countless classes, hikes, and engaging stories. The Visitor Center at Huntley Meadows Park was named in her honor in 2013. She will be remembered, and she will be missed. This entry was posted in Uncategorized on June 12, 2017 by Fairfax County Park Authority. Children get hands-on with nature. Normally our blogs are written by someone who works for or with the Fairfax County Park Authority. Not this one. This one was written by students of Walt Whitman Middle School after their Meaningful Watershed Educational Experience (MWEE) along South Run Stream Valley this spring. MWEE is a regular part of the fourth and seventh-grade curriculum in Fairfax County Public Schools. This entry was posted in Uncategorized on June 9, 2017 by Fairfax County Park Authority. Nature glories in being mysterious, but recently she has been downright confusing. Why cicadas now? These clumsy, noisy creatures are bumbling through the air looking for a mate but not having much success. Turns out that the raucous critters are four years too early. Back in 2004, millions of periodic cicadas in Fairfax County created a din rivaling that of a lawn mower. These cicadas were to spend their 17 formative years underground as a larva quietly sipping sap from tree roots. Then, in a mysterious synchrony, they would emerge to shed their exoskeleton above ground. They would then leave a crispy, tan exuvae behind as they fly off in their adult form. So why, suddenly, a 13-year cycle instead of 17? First, a little about these insects. Cicadas cannot bite or chew, nor can they sting, so they pose no risk to curious kids. They can use their beak-like proboscis to pierce twigs to consume tree fluids. They are a scrumptious treat for most wildlife from birds to mammals to fish to fungus, and with only a short life as an adult, under two weeks, the periodic cicadas typically survive by overwhelming their predators with sheer numbers. As large and noisy as these insects are, they are easily found and munched. Those who do not get eaten get to mate. As adults, that’s the main goal for cicadas — find a mate. Females quietly cruise while the males beat a come-hither call with their bodies. As a result, a lot of noise. The lucky surviving females lay their eggs in thin twigs on trees and then die. The twigs eventually snap, resulting in dead leaves called flagging that hangs off tree tops. The tiny larvae sup on the fluids in the twig, grow, and soon fall to the ground. There they burrow underground to start their count to 17 (or 13 if that is their cycle). This elegant dance takes but a few weeks, and then the tree tops are quiet again. Periodic cicadas baffle humans, even when they are expected. How can they count to 17? How do they all emerge at the same time? Why are they flying into my face? Why are they all over the road? Cicadas were pre-Ice Age residents, and our dominance of the landscape is a relatively recent phenomenon. As the ground cicadas dig into is paved over, the patient larvae emerge only to bump their heads and lose the chance to mate or be a meal to a grateful predator. The early emergence of the periodic cicadas is not a new phenomenon. Chris Simon, a professor of ecology and evolutionary biology at the University of Connecticut, surmised that the cicadas have four-year development cycles, which could explain why “stragglers,” cicadas that are four years too early or too late to the party, regularly occur. Others proffer that global warming could speed up the larvae development. Scientists estimate that this spring’s emerging population represented ten or less percent of the total population. If that’s accurate, just wait ’til 2021! Cicadas may creep out humans with their size, noise and numbers, but they shout the primacy of nature. For a few short weeks, nature cannot and will not be ignored. That alone makes the mystery of the cicada inspiring. Perhaps that is why genus name is Magicicada. For now, Fairfax County residents can marvel at the noisy, bumbling mystery. We may never know all the answers but can take joy in the wonder. Author Suzanne Holland is the Assistant Manager at Hidden Oaks Nature Center in Annandale, Va. Photos provided by Park Authority staff and photographer Tuan Pham. This entry was posted in Uncategorized on June 5, 2017 by Fairfax County Park Authority.